Germany is blessed with some of Europe’s most visited sights. There’s spectacular scenery like the jagged Alps, flower-filled meadows, rolling hills, and mighty rivers all dotted with castles and half-timbered villages. From quaint medieval towns to cosmopolitan cities, Germany offers a mix of tradition and modernity. Octoberfest – For 12 days at the end of September and into early October, Munich hosts the world’s largest beer bonanza. Ride the Train – Riding the train in Germany proved to be way more beneficial than I anticipated. It’s quick, cost effective, and runs like clockwork. Other passengers are friendly and helpful, especially when traveling with children. Athena loved getting her own ticket and playing with Mommy while traveling. I didn’t need to worry about driving myself so I could focus all of my attention on her and the spectacular scenery. Berlin City Capital – Berlin was the capital of Prussia, the German Empire, the Weimar Republic, and the Third Reich before being divided after World War II. The must-visit Reichstag was reconstructed with a special glass dome after reunification. From the dome, you can see directly down into the parliament chambers below—a symbol of government transparency. The iconic East German TV tower, a symbol of political power, also makes a great stop. The Checkpoint Charlie museum details accounts of people escaping the GDR. The Topography of Terror exhibit hall, another must-see, is a rich source of information on the Nazi regime. 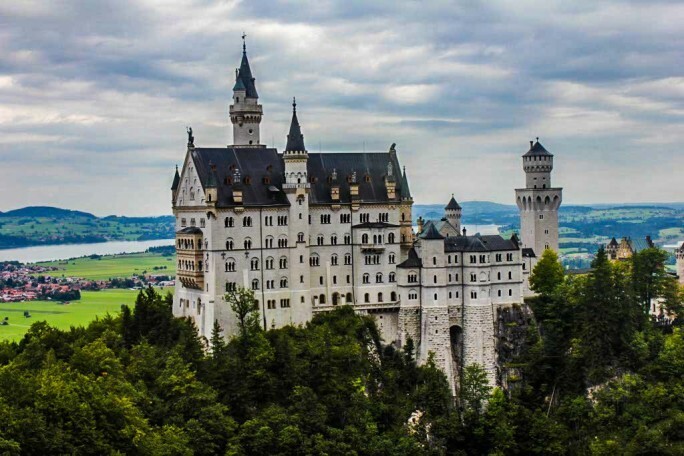 Visit Neuschwanstein Castle – Neuschwanstein Castle should be on everyone’s bucket list regardless of age. It’s ideally situated with the Alps on one side and flatland on the other side. Although its history isn’t as pretty, the castle itself is fairy tale worthy. You don’t even have to go inside to appreciate its beauty. Just stand on the neighboring bridge and reveal in the remarkable seven stories of greatness. The Berlin Wall – When the wall fell in 1989 Berliners couldn’t wait to get rid of it. As a result, there is very little of it left. The longest is “The East Side Gallery,” a mile-long stretch where international artists converged in 1990 to paint murals in a tribute to peace. The excellent Berlin Wall Memorial, located along another remaining stretch, has a museum and open-air exhibition dedicated to the years of division. Cobblestones mark the streets where the wall once ran throughout the city. Cable Cars to Mount Zugspitze –Do you want to see what it feels like to have Germany at your feet? Visit Mount Zugspitze! At 2,962 metres above sea level, the Zugspitze is the highest mountain in the country and home to three glaciers and Germany’s highest ski resort. Right at the top, an impressive 360° panorama opens up to reveal extensive views over 400 mountain peaks in four countries. The spectacular views are just part of the adventure. Riding the cable cars are equally fun for children. The transportation in Germany is as exciting as the destination. Ride the Forggensee Lake Ferry – One of the biggest tourist attractions in Füssen are the boat tours on the idyllic Forggensee Lake. They offer amazing views of the surrounding mountainscapes, the city of Füssen, and of the world famous castles Neuschwanstein and Hohenschwangau. Stay at Kinderhotel Oberjoch – Kinderhotel Oberjoch is a child-friendly, all-inclusive hotel located in a sunny Alpine valley 1,200 metres above sea level in Germany’s highest mountain village. All of the hotel’s facilities are tailored to small guests including a zoo, a theater, a bowling alley, play lands for various ages, in-house childcare for children as young as 7 days old, an indoor children’s pool, a skating rink, hiking trails, and an adventure club. Visit Island Mainau – Allow yourself a break and enjoy a walk around Island Mainau or The Flower Island. The paths are alive with thousands of blossoms, shrubs, and trees. For children, there is a water world, a petting zoo, a butterfly house, and a children’s land with little houses and towers. Visit Affenburg – Affenburg is like being in the Planet of the Apes. More than 200 Barbary apes live freely in a 20 acre wooded area called Monkey Mountain in Affenburg Salem. Here, you are able to see the apes in their natural environment, observe their natural behavior, and hand-feed them. Don’t worry if you’re fearful of the apes. There are trained staff to guide you in the process and answer any questions. Visit Europa Park – One of the world’s leading theme parks, Europa Park should already be on your radar. Consisting of 13 European-themed areas with typical national architecture, foods, and flora, Europa Park is like visiting most of Europe in one day. There are 11 rollercoasters for the fearless and entertainment by 250 international artists who preform magic, juggling, singing, and dancing for those who want to take it more calm. Money Matters – The euro (€) is used in Germany. All major U.S. credit cards are accepted in Germany. The most frequently used are MasterCard and Visa. When to Visit – Germany is a year-round destination but it’s particularly wonderful May through September for the long mild days that stretch sightseeing hours and are perfect for relaxing in beer gardens. In the north, January can be dark and cold. Southern Germany, on the other hand, is a great winter destination, with world-class skiing, spas, and wellness options. Manners – If you’re invited into a German home it’s polite to take a gift like flowers or wine. Say ‘Guten Appetit’ before eating and eat everything on your plate or they’ll think you didn’t enjoy your meal.